You may be having problems finding a 42-inch built-in refrigerator. Standard cabinets are 36 inches, so you will find fewer choices in a single refrigerator. If you haven’t been in the market for 10 years or more, then you may like two separate units instead of the one larger refrigerator. What’s the difference between refrigerator styles? Smaller integrated units have become much more popular over the last few years because you can customize your options and the placement of your refrigeration. They also fit within a cabinet and become indistinguishable with the rest of your cabinet. In this article, you will learn about the best 42-inch counter depth refrigerators and all the options fitting a 42-inch cabinet. Capacity – At 25 Cubic feet, this is the largest 42-inch built-in refrigerator on the market. Freshness – Sub-Zero was the first on the market with two separate cooling zones. This keeps dry, very cold air out of the refrigerator and keeps the warmer, humid air out of the freezer preventing freezer burn in the freezer and frozen, dried out food in the refrigerator. Air Purification – The “Pure Air” system scrubs the air every 20 minutes to keep foods as fresh as possible for as long as possible. Crispers and Deli Drawers - Located near the evaporator, these bins are kept a little cooler than the rest of the refrigerator and are magnetically sealed for fruit and vegetable preservation. Microprocessor - Keeps temperature accuracy to within 1 degree for optimal freshness. Also lets you control lighting, alarms, ice production and monitors usage to defrost when you are the least likely to be using it. LED Lighting – Crisp LED lights are designed to be brighter than standard bulbs and give off no heat. The LED bulbs are energy efficient and designed to last the lifetime of the refrigerator. Soft-Close Deli Drawer – A full-width, soft-close deli drawer allows for wide platters or small items that can be separated with the included dividers. Adjustable Shelves – The adjustable shelving is designed with any item in mind and can accommodate a great variety of food sizes and shapes. This is the best 42-inch counter depth refrigerator on the market. From the best food preservation system to capacity, adjustability, and overall longevity. With the full 42-inch width, this refrigerator and freezer give you the ability to put those wide platters, roasts and anything else in the refrigerator. The food preservation system scrubs the air of ethylene (the gas that fruits and veggies give off that make them go bad, quick), mold, bacteria and viruses every 20 minutes keeping your food fresher, longer – no one else on the market has this sophisticated of a system and no one else achieves the freshness results. Imagine an avocado lasting 2 to 4 weeks in a refrigerator – that’s how well this system works. The shelves are split and allow for many different configurations. Their nanotechnology coating does not allow the spills to spread. LCD Controls - Simple to use controls and crisp LCD display, the True 42 control panel offers professional performance. Ramp -Up Lighting – Beautiful LED lighting to showcase a beautiful all stainless steel interior – no plastic anywhere. Door Bins - Three adjustable, removable door bins are adjustable and made from pro grade stainless steel for hygiene, cleaning and overall longevity. Glass Shelving - Stainless steel trimmed glass shelves that are both adjustable and removable. Drawers - Soft-close glides and stainless steel for durability and ease of use. Freezer Baskets - Three polished stainless-steel wire baskets are easy to see and are also smooth-glide for a quiet, solid feel. Door Hinges - Solid stainless steel and designed to stay open at 120°, each high-grade hinge passes extreme testing and has a silent, soft close. True has a commercial fit and finish. Although most 42-inch side by side units are extremely cramped, due to the interior depth of this unit, you can actually fit a considerable amount. Because their shelves are 15 inches deep and one shelf is over 19 inches deep, roasts fit. Not as much room as the French door Sub-Zero due to its width but better than most, if not all, side by side units on the market today. “Obsidian Interior”/LED Theater Lighting - Designed in conjunction with the LED lighting, the Obsidian interior and LEDs make anything in the refrigerator “pop” with color. Fully Flush, Fully Integrated Design - Fully flush design allows complete cabinet integration for a seamless look in a 25-inch deep cabinet. Panel Ready or Stainless Steel – Building on the fully integrated design, you can match surrounding cabinetry for a fully integrated, looks like pantry doors look – your guests will not even know that it is a refrigerator without opening the doors. Stainless steel door panels, sold separately, match the rest of the Jenn-Air suite of appliances. TwinFresh™ Climate Control System - With two evaporators (the part of the motor that cools the air), air in the refrigerator is kept separate from the freezer to avoid freezer burn and frozen/frosty vegetables. Light-Guided Capacitive Touch Controls - Easy to use and see intuitive touch controls. Soft-Close Crisper Drawers - Quiet, secure and easy to use. Also has an ethylene gas absorbed to prevent fruits and vegetables from rotting too quickly. This beautiful 42-inch wide French Door refrigerator from Jenn-Air ticks a lot of the right boxes. The separate air for the fridge and freezer sections to prevent freezer burn and frosty produce, air filter for fresher produce and to prevents odors, excellent lighting, fully integrated for that seamless look in the kitchen and of course access to the full width in the interior. However, at 25 inches deep overall including the doors, it is over 2 inches shallower than the Sub-Zero and over 3 inches shallower than the True. Some deeper items are harder to fit. It also does not have spill-proof shelves like the rest on this list. Open Door Assist - This new system from Thermador allows you to not have to use a handle – just push on the door and it automatically opens. You can set it to automatically close if accidently opened as well. ThermaFresh - Automatic humidity and temperature control. Delicate Produce Bins - Soft close bins located on the door provide a safe space for delicate produce that can bruised and be damaged easily. 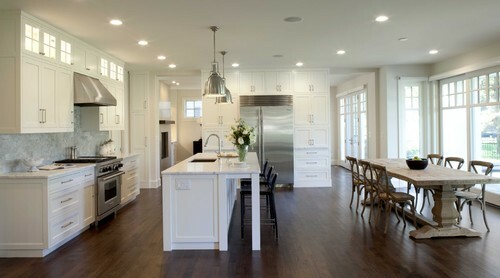 Theater Lighting - Light bars on both sides of the refrigerator and freezer, give the best view to every corner. Cool Air Flow Technology – New energy efficient system to optimize temperature accuracy and energy efficiency without sacrificing performance. Soft-Close Drawers - Quiet and easy to use. The produce bin also has an ethylene filter to keep fruits and vegetables fresher, longer. All Leg Leveling - Easy and efficient way to level for fast and accurate installs. Diamond Ice - Thermador’s uniquely shaped ice designed to keep drinks colder, longer. Stunning would be the word to describe Thermador's new refrigeration. Inside and out, the 18-inch freezer and 24-inch refrigerator columns make a gorgeous 42-inch pair. From being able to use them without handles to the interior ramp-up, theater-style LED lighting, this hits the mark for the designer in everyone. With a crisper drawer that filters out gases emitted by fruits and veggies that accelerate spoilage and their air management system, this combination keeps your food fresher and longer as well. The only drawback to this pair is the space – a 24-inch wide refrigerator and an 18-inch wide freezer mean wider items are harder to fit. Add in the 25-inch total depth with doors, and the more than 2 inches shallower than Sub-Zero and more than 3 inches shallower than the True, big items like roasts, pizza boxes, platters, etc., just do not fit. Prepare for a backup fridge in the basement for those extra-large items. Thermador has a great rebate program as well, with free dishwashers and hoods with qualified purchases. Professional refers to a more commercial looking product with the compressor on the top. They are available in 30" and 36" as well as larger sizes like 42" and 48". Regular counter depth refrigerators are just shallower refrigerators and are only available in smaller sizes like 30, 33 and 36-inch widths. 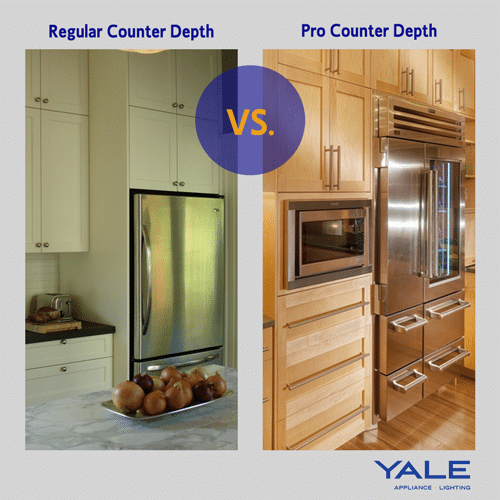 The price of a regular counter depth refrigerator is much cheaper at $1,700 to $3,500 vs. $8,000 plus on a professional. 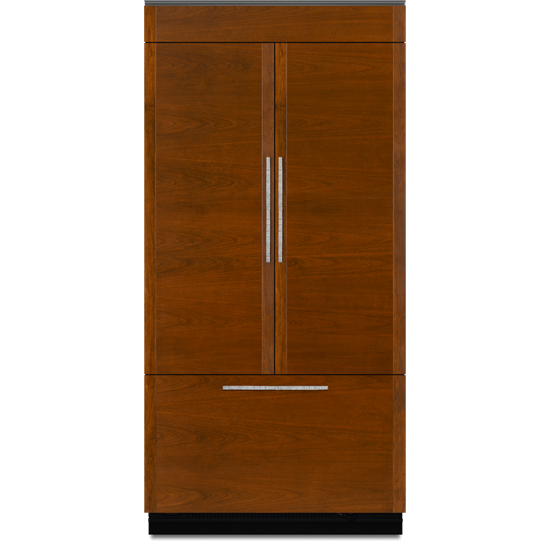 Integrated refrigerators fit within the 25-inch cabinet depth, so they are indistinguishable from the cabinet itself. The door of the professional (and regular) counter depth will protrude up to three inches. Integrated refrigerators are available in smaller sizes like 18, 24, 30 and 36 inches. You would buy two for 42 inches width. Integrated is more expensive per cubic foot than the pro. They offer two different looks in your kitchen. One is noticeable and the other is completely hidden. There certainly are some great choices for 42-inch refrigeration. What will help you decide between them is knowing what your priorities are. If you are looking for function, the Sub-Zero French door is your best bet - Sub-Zero is the best in the industry. If you want a similar function with the ability for wide items but depth is not as much of a concern and price is a factor, the Jenn-Air would be my recommendation. For that fully seamless look in your kitchen, and if you can work around how shallow it is, the Thermador is one of the best-looking appliances on the market with great function, if only a little shallower than I would prefer. For that commercial grade and look and the largest capacity overall, look no further than the True 42-inch. 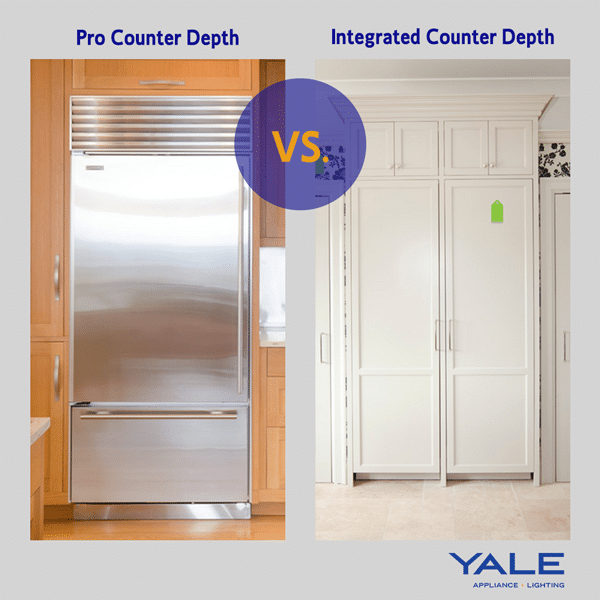 Want to learn more about counter depth, professional and integrated refrigerators? 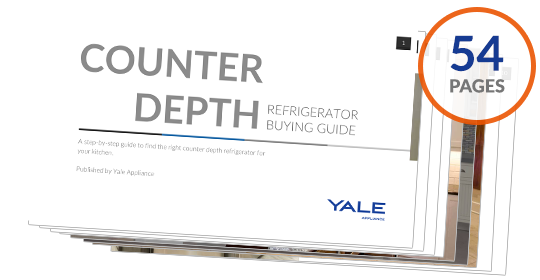 Get the Yale Counter Depth Refrigerator Buyers Guide with features, specs and inside buying tips to all the brands. Well over 150,000 people have read a Yale Guide. Editor’s Note: This post was originally published in October, 2014 and has been updated for freshness, accuracy, and comprehensiveness. Adam Thomashow is an Appliance Sales Consultant at Yale Appliance + Lighting. He has worked in the Appliance Industry for over 7 years. He attended the University of Connecticut for Computer and Electrical Engineering and is an A+ certified computer technician. During his time off, Adam loves to spend time with his toddler. He also enjoys watching baseball and football.